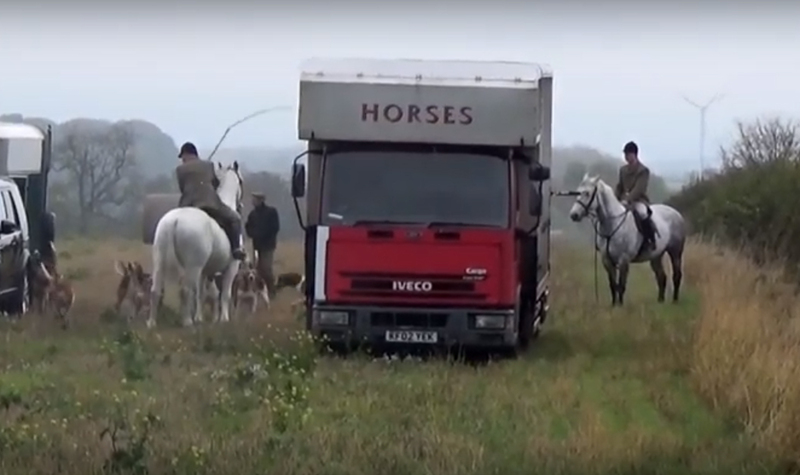 ITV NEWS - Hunt Protestors Pelted With..
With our new hunting team fully settled in and the season now fully underway we thought it was time for another update. In previous seasons our hounds have been a bit unruly and have left our huntsmen a bit embarrassed at being unable to control them. It’s good to see our new huntsman knows how to earn the respect of all his hounds and is quickly beating a bit of discipline into them. 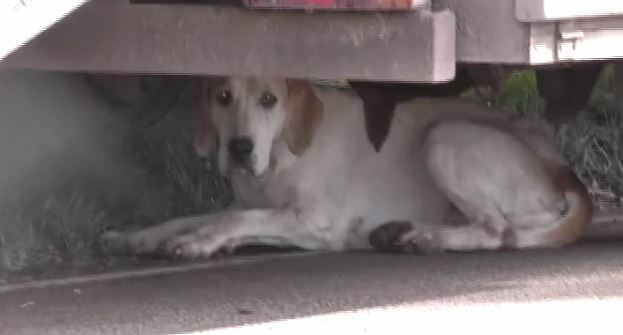 If ever these videos prove one thing, it is the love respect, and admiration the true Hunting person has for their Hounds. Let no man say otherwise!! We’d like to say a big thank you to Cattows Farm who continue to promote bloodsports and are helping to keep the tradition of bloodsports alive. They once again allowed us to parade our hounds around their farm at the Ashby Show as well as other local hunts (our partners in crime) the North Warwickshire Beagles and the Dove Valley Mink Hounds. We appreciate Cattows Farm (https://www.facebook.com/cattowsfarm/) allowing us on their farm as it is one of the few opportunities we get to portray ourselves as decent people in front of members of the public without being reminded of our 20+ convictions for violence and anti-social behavior. Speaking of violence it won’t be long now before the early morning starts and the sound of hounds in cry before they dispatch a family of fox cubs. We can’t wait. As many of you may have heard by now our plan to rid ourselves of the saboteurs has failed and with it any hope of bringing back the good old days. After several meetings with Leicestershire Police last summer we decided to make up some allegations that we felt threatened and intimidated by the swearing, shouting and threats coming from one of the saboteurs. 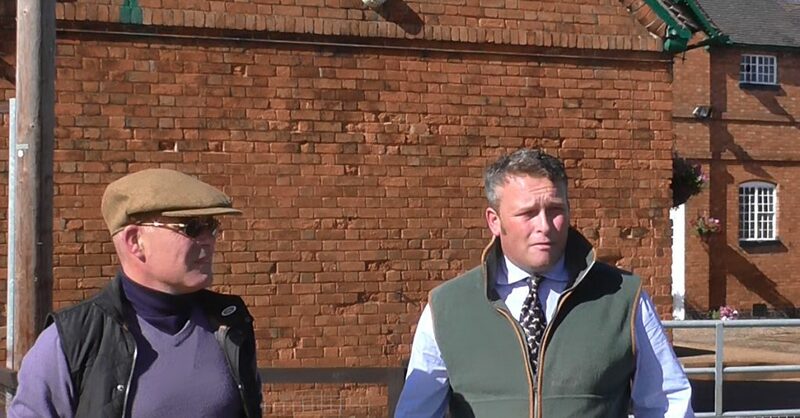 We brought in expert liar Mike Lane as our new huntsman and joint master and we felt that he was the best person to make the initial complaint to the police due to the excellent lies he has told at his previous hunt. He was backed up and assisted by Mark Halford who we brought in to help with our public relations and the negative image we seem to have acquired. We were told by Leicestershire Police that our case would be stronger if we had one more person make a statement so our kennelman Oliver Hope stepped up and helped us out. Leicestershire Police continue to have our best interests at heart and hate the saboteurs almost as much as we do (without the saboteurs constantly showing them up they wouldn’t have to pretend to show any interest in stopping fox hunting) We believe they tried their hardest to push this prosecution all the way and despite them telling us it was a fool proof plan they may have overlooked the fact that it wasn’t an Atherstone Hunt proof plan. For some reason we all believed that one of the saboteur groups best know for filming everything had somehow not filmed anything at all on this particular day. Mike Lane found out how wrong we were and had a hard time on the stand (he rushed out to the toilets to text the other two to warn them once he had finished) There was footage and it completely disproved our story. Mr Halford tried his hardest to lie his way out of trouble on the stand but couldn’t pull it off and sound believable. Mr Halford may have overdone it a bit by claiming he believed the saboteurs had bugged his phone. Being a huntsman who hunts foxes we are still not sure why Mr Lane decided to claim he found a picture of a dead fox upsetting. And we can’t begin to imagine why Mr Hope told the court that he feared for the safety of his wife and children who he then went on to say weren’t even present on that day. 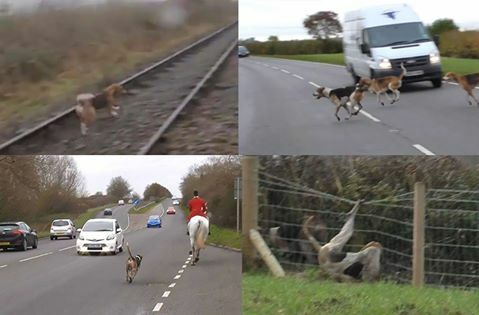 Lets not blame Leicestershire Police for this failure as we only have ourselves to blame for this one, like I said it may have been fool proof but wasn’t quite Atherstone Hunt proof. We should be grateful for the continued support from Leicestershire Police who have many officers who continue to enjoy riding to hounds. 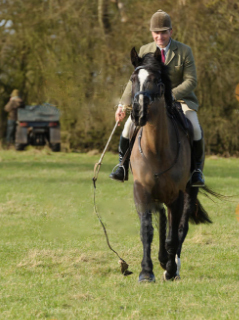 If we want to blame anyone then blame Mr Halford, he came here promising us he would save us from the antis with his talk of injunctions, instead this has turned out to be a very embarrassing episode for us and he has dragged our hunts name through the mire once more. Mr Halford is no longer on our board of directors which I know many of you will be pleased to hear. I know we promised many of you at the start of the season that for one season only we would try our hardest to stay out of trouble and look like we were trail hunting. After one season we hoped we would be rid of the saboteurs and could carry on where we left off 5 years ago before the saboteurs showed up. We made the same promise to our new huntsman Bill Bishop who may now regret coming here. Although rent-a-huntsman Bill never stays at any hunt long I’m sure he can put up with us for a season. Lets face it he can’t be any worse than Mr Lane, we may even keep control of our hounds for an entire meet this coming season. All we can do now is to have faith in Leicestershire Police and their commitment to country sports and hope that one day they rid us of the antis. Is this not another telling photo of the relationship between man and his Hounds? One which our opponents continually think they can destroy. Well one thing is for certain, they better just think again. 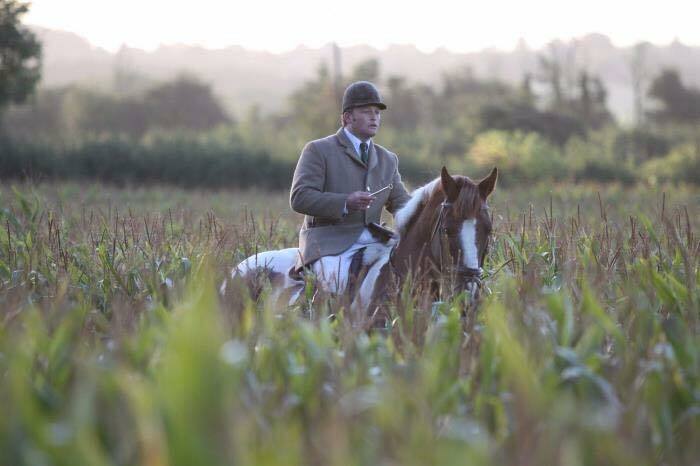 Our huntsman Mike Lane loves his hounds so much he gives them total freedom to go where they want in the countryside. Sometimes they may venture onto roads and even main roads but only when they have got onto the scent of a fox. 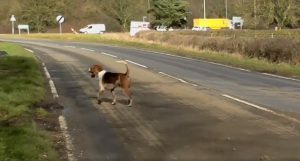 Of course it’s not Mr Lanes fault that his hounds divert onto the scent of real foxes, the foxes should know better not to live in places that Mr Lane frequently takes his hounds such as small coverts and hedgerows. One often wonders that the fox isn’t up for it otherwise why else would they live in artificially made homes that we encourage them to live in, they must surely realise that the free food and shelter comes at a price. Mr Lane tries his hardest to stop his hounds chasing foxes but more often than not they don’t listen to him, he spent almost an hour recently trying to call his hounds back to him. That brings our total convictions up to 21 and we’re sure there’s a few more just over the horizon We thank Leicestershire Police for helping us keep the number as low as it is, it could have been double that without your help. With the start of Cub Hunting fast approaching a number of you have contacted us worried about the effect that certain unwelcome guests will have on our hunting this season. Well we can tell you that we certainly don’t want our normal activities curtailed we want to watch full on hunting. As a result of these unwelcome guests and of course the police presence we have devised a cunning plan. New joint master Mark Halford brings with him from the Quorn Hunt Mr Bruce Langley Mckim (you can meet the rest of our team here). As well as pretending to lay trails for the Quorn Mr Mckim was for a season the huntsman of the Readyfield Bloodhounds. This season Mckim will be laying trails for us, the trails will of course be laid in places that we know that foxes live (along hedge rows, small woods, crop fields etc) providing us with plenty of accidents throughout the season whilst also giving us an excellent alibi. It is also a great opportunity for us to try and stitch the sabs up for aggravated trespass. Here’s a photo of Mr Mckim pretending to lay a “trail” at the Quorn. The keen eyed among you will notice the terrierman stood next to his quad bike in the background. What is he needed for if your laying trails? I hear some of you ask, well it’s best not to ask as our opponents may be reading but lets just say that our friend with the quad bike is on stand by in case Mr Mckim’s “trail” should find itself down a badger sett. Indeed he will have taken measures with his spade to prevent Mr Mckims trail from being able to end up down the badger sett in the first place. If you haven’t seen it already please do check out the new page on our website listing all of our criminal convictions, 20 so far, it’s quite an achievement. No hound picture this month instead a picture of myself in the middle of a field of crops. What might I be doing in there I hear you ask and what small mammal might I be looking for? Answers on a postcard. I’m going to let you in on a little trade secret now.. Crop fields provide animals such as foxes with warmth and shelter, you’re guaranteed to find foxes living in them. So, make out we’ve somehow laid a trail through it, put the hounds in and they inevitably “accidentally on purpose” find the fox and bob’s your uncle (although bob’s been banned due to his racism) make sure the crop field is surrounded by riders so nothing can escape and a bloodbath ensures and lots of dead fox cubs. We have a whole two months of this to look forward to and we’ll be out several times a week. Just imagine how many foxes we’ll have killed by then. What you must understand is that these sabs are always filming us which means we can’t hunt foxes freely like we used to. This obliviously gets very frustrating to some of our supporters who rely on a few dead foxes to keep their spirits up during the winter months. So who can blame them when they lash out? We certainly don’t. After all violence is the only language some of our supporters are fully fluent in. Our good friend and former huntsman/cop Brett Parker put it best when he said he wished it was still the 80’s when we could give sabs a good hiding. Wise words indeed. When we can’t kill foxes bashing a few sabs is the next best thing. It’s almost a tradition in it’s self. However it’s not the 80’s and these convictions make it harder to keep labeling the sabs as the violent ones considering they have no convictions whereas ours are steadily staking up. Well what a month it has been. Unfortunately the election result means that hunting is not going to be legalised any time soon but on the bright side we at the Atherstone Hunt like to carry on as if hunting were legal anyway. We like to think that the Atherstone Hunt played its part in the election result by reminding people just why they hate hunting so much. Our opponents used underhand tactics to try and get us dropped from the Ashby Show, luckily the landowners Cattows Farm decided to allow us onto their land anyway so that we can promote blood sports and raise some much needed funds for ourselves so that we can carry on killing foxes in the season coming. Thank you Cattows Farm. Finally some good news for a change, after dragging our name through the mire the investigation into us killing a fox has been dropped giving us the green light to carry on where we left off last season and hopefully kill a few more this coming season. Despite the clear footage filmed by the antis the loopholes in the Hunting Act mean we can do what we like. Which we do. 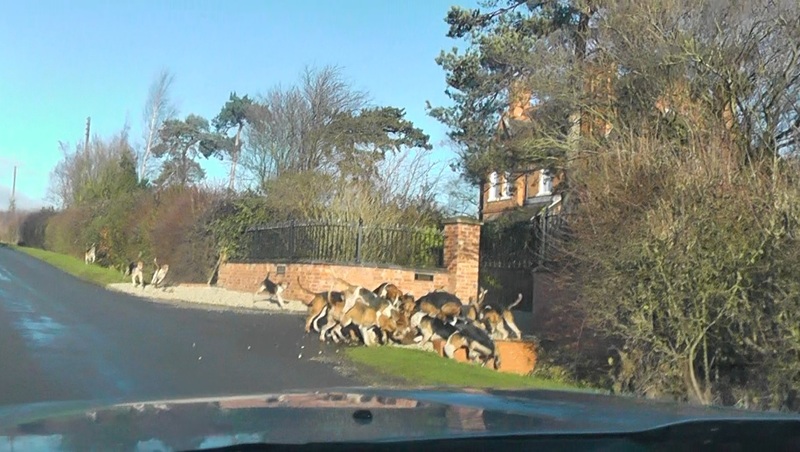 This months hound picture is of our hounds doing exactly what they are bred and trained to do, rip foxes apart. Good stuff. We have been busy canvassing for the Conservatives over the past six weeks, and what subject have we found comes up a lot? Hunting of course! We always move swiftly on from the subject as most people don’t seem to like it but that is besides the point, what’s important is that in return for all the campaigning we’ve been doing the Conservatives have promised us they’ll legalise fox hunting. We will finally be able to ruthlessly and our opponents may say, cruelly kill foxes. Let’s not focus on the cruelty but instead the enjoyment we will get from that cruelty. Forget all the arguments about needing to control the fox population, they don’t need controlling (we should know as we ensure there are always plenty of them for us to hunt). No this has always been about our love of violence. The enjoyment we get from chasing a small mammal for miles until it is exhausted and the thrill of seeing it ripped apart by a pack of hounds. A vote for the Conservative party means we will no longer have to worry about tiresome police interviews, no more lying about what we are doing, we will be able to kill foxes till our hearts content.